Credit cards make it easy to borrow money in a pinch, but they aren't ideal when you need time to pay the money back. The average credit card interest rate is currently over 17% APR, after all. That's a ton of money in interest to fork over for no real benefit, and the cost can be even more crushing if you need months or years to repay. Personal loans come with many of the same pitfalls as credit cards, including how you can easily bite off more than you can chew. You can overspend and send your finances into a tailspin with credit cards or a personal loan if you don't know your limits. If you're going to apply for a personal loan, make sure you use it the correct way. A mid-range bathroom model cost $20,420 while a mid-range kitchen overhaul cost an average of $66,196, according to Remodeling Magazine's 2019 Cost vs. Value report. A personal loan lets you borrow a large lump sum of money for a home remodeling project and repay it slowly over time with a competitive APR. Replacing a leaky roof with asphalt shingles cost an average of $22,636, but how would you come up with that money if you had to? Of course, there are other expensive components of a home that need to be replaced or fixed from time to time, including HVAC systems, plumbing, electrical, and more. An unsecured personal loan could provide you with the cash you need with a monthly payment you'd probably be able to afford. Finally, a personal loan can be used if you need startup costs to buy supplies or invest in a new business. As your business grows and becomes profitable, you can repay your loan and reinvest your company's profits. Don't apply for a personal loan if you plan on using it the following ways. If you need to borrow money to go on vacation, you're can't afford to take one. That's a painful truth, but it's one many people refuse to acknowledge. Paying for a vacation with a personal loan may seem like a good idea, but you'll regret it once you're making payments on that trip for years to come. Buying a car with a personal loan isn't the world's worst idea, but it's certainly not the best. An auto loan that is secured by the car you're buying will likely come with a lower interest rate and better terms. Using personal loan money to gamble is never a good idea. If you lose your shirt (which you likely will! ), you will still have to make payments on your personal loan until it's paid off. Never gamble unless you have the money to lose. Gambling your personal loan funds is a bad idea, but so is using them to invest. 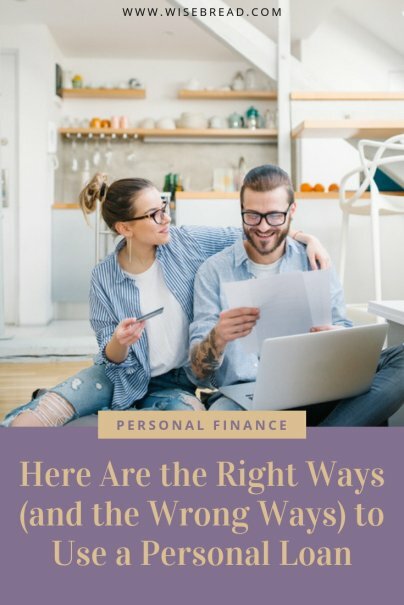 You may believe you can earn more money investing than you pay in interest on your personal loan, but there are no guarantees when you invest your money — no matter how experienced you are. If you invest and take a big loss, you'll be out your personal loan funds plus interest. Personal loans are easy to apply for, which makes them incredibly appealing but also dangerous. If you borrow for the wrong reasons and don't have a plan to pay the money back, you could wind up making a financial decision you'll live to regret. As a general rule of thumb, it only makes sense to borrow money when you have a clear purpose and a realistic plan to pay it back. If you borrow without any real goal in mind or the money to repay what you owe, you're setting yourself up for failure.